When walking into the main lecture room on the first morning of the induction week, the buzz in the room was electric. With over two hundred students ready to begin their journey from learning to teaching, I felt immediately that I belonged to this group of people. I was proud that I had decided to become part of a community of teachers in Wales, and to be a part of an education sector that’s currently going through very exciting changes. The room was filled with exciting chatter – everyone busy making friends and sharing their fears and experiences. When I think about the big step I’ve taken to study the Primary PGCE course, I feel really glad that I have committed this year to become a qualified teacher at the University of Wales Trinity Saint David and look forward to the year ahead. During the induction week, we had a chance to get to know our lecturers who all made sure that we felt comfortable and stable at the beginning of our journey. 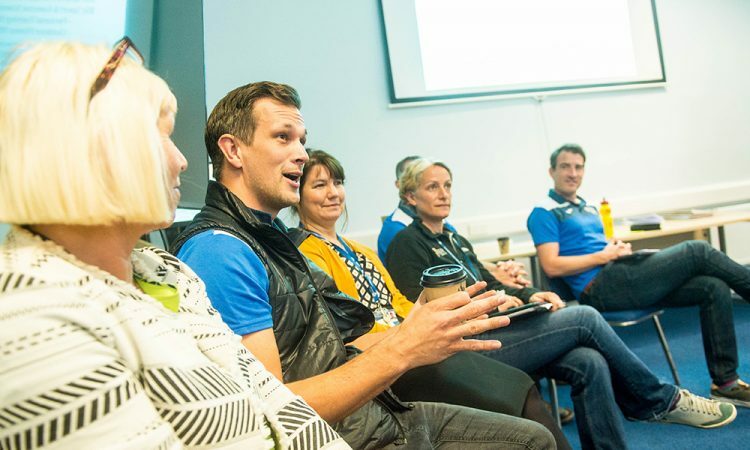 I studied my undergraduate degree at UWTSD, on the Carmarthen campus, and it’s nice to see that the friendly ethos and sense of community and belonging is here at the Swansea campus too, just as it was in Carmarthen all those years ago! During the first weeks of the course a lot of important information was shared with us – it’s a busy and intense course! We are in almost 9-5 every day, I do feel that I have been armed with everything that I need before the start of teaching experiences. The highlight of the induction week was on the Friday afternoon when we were set a challenge to complete a Primary PGCE picture hunt around Swansea. After placing ourselves in groups, our friendship blossomed and our sense of belonging developed – and we had a great time doing it too! It was great to get to know new people and develop our friendship while enjoying all that Swansea has to offer. We laughed as we did the conga in the centre of town and created sand castles on the beach. It was a great start to the course and a fantastic way to get to know the city where we now study – which is also my new home for the year – and get to know each other. We created a Padlet during our fun tour of Swansea which was part of the task – it was great to play around with new technology as part of the team building exercise as the technology will become an important part of our work as future teachers. We will certainly need to support each other along the way as we continue on this intensive and challenging course, but after a busy induction week, I’m glad to say that I have made good friends and have met with supportive and enthusiastic staff. I look forward to the coming months when we go out on teaching placements and having real life experience of the work we’re learning in class.